tasting :: my first nectarine and plum of the season, vanilla vegan protein shake, watermelon, chocolate chips, dilly scrambled eggs, rainbow quinoa salad, lemon soy yogurt, cornmeal crust pizza, vegan brownie and french fries at sugar plum vegan, lemonade, almond butter and honey on rice cakes, coconut almond oatmeal, mango/pineapple smoothie, asparagus, cabbage and broccoli over israeli couscous, bacon burger and fries. hearing :: three year olds “playing together” aka lots of crying, laughing and protesting. smelling :: the swimming pool, watermelon and coppertone sunscreen. seeing :: an artist born. my girl and i have taken up watercolor painting this week and i’m not sure who is loving it more. feeling :: oh so full of doubt. discouraged. the other side of doubt. grateful. wishing/hoping :: i am really missing restful sleep in the morning. a full mind is waking me up before sunrise. hoping for some peace and deep sleep. Do you wish you could end the school year feeling as energized as you started it? Does recovering from the school year take most of your summer? Are you ready to press reset but have no idea where that button is? The Healthy, Happy, Sane Teacher is the reset button. Keep up with The Healthy, Happy, Sane Teacher here. 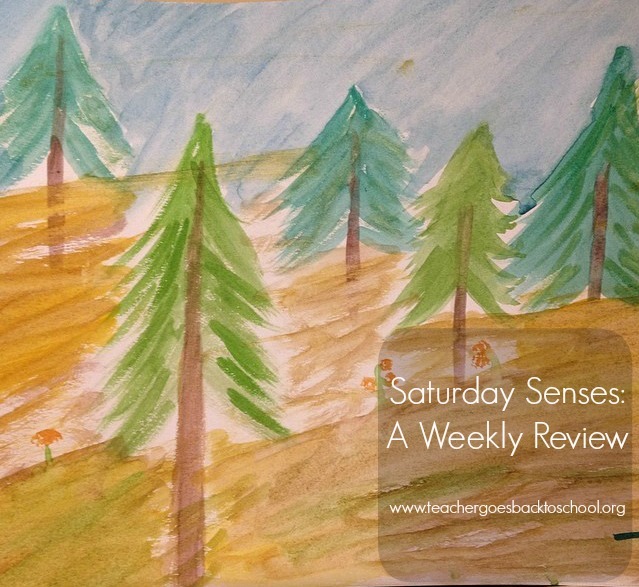 This entry was posted in Saturday Senses and tagged weekly check in, weekly review, weekly update, weekly wrap-up by Teacher Goes Back to School. Bookmark the permalink.